How to enjoy, and pronounce, the supergrain that’s not a grain. Quinoa is a fluffy, gluten-free alternative to run of the mill grains; it’s packed with flavor plus protein, iron and calcium. Superfoods were a topic of this blog last week: the array of red/orange and green hued vegetables, unique good-for-you fats, and cultured and fermented foods. Did you notice that this concise list of top food world performers includes not a single grain? But of course, grains are good too. They may not make it to the gold medal platform of the superfood Olympics, but they’re certainly there at silver and bronze levels. Many people have discovered it in recent years, but quinoa deserves to be further called out for its special merits. Unlike most grains, it’s very high in protein – and a complete protein at that, meaning you don’t have to match it with beans, say, to get all nine essential amino acids. Quinoa is also very high in iron and calcium. But what you really need to know about quinoa is that it tastes really good. It’s fluffy and nutty, less bland or starchy than rice but still a good foil for just about any combo of vegetables, meats or spices. Cooking is quick – only about 15 or 20 minutes – and transforms the tiny dot of beigey yellow into a light sphere with a little ring around it. Crazy as that sounds, it’s quite a beautiful little grain. Some recipes suggest you rinse it before cooking, to remove any bitterness that might still coat the grain (saponin, a natural insect repellent). But these days, many quinoas come prerinsed, and I never bother. Also, toasting it first is optional, for a touch more flavor, and again, I don’t bother with that step. For me, quinoa comes good to go, grain or not. Here’s a great and easy recipe (from Moosewood Cooks at Home) to launch your own adventure with quinoa. Using a fine seive, rinse quinoa well (optional). Place it in a pot with the water and cook, covered, on medium-low heat for about 15 minutes, until soft. Set aside. While the quinoa cooks, in a covered soup pot saute the onions and garlic in the oil for about 5 minutes on medium heat. Add the celery and carrots, and continue to cook for 5 minutes, stirring often. Add the bell pepper, zucchini, tomatoes, and water or stock. Stir in the cumin, chili powder, coriander, cayenne, and oregano, and simmer, covered, for 10-15 minutes, until the vegetables are tender. Stir the cooked quinoa into the stew and add salt to taste. Top with cilantro and grated cheese, if you wish. Serve immediately – and enjoy! 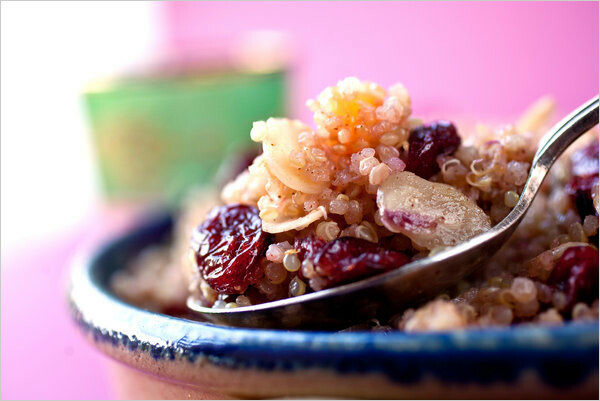 Martha Rose Shulman in the New York Times also has some creative ideas for ways to use quinoa in breakfast cereal and in baking.